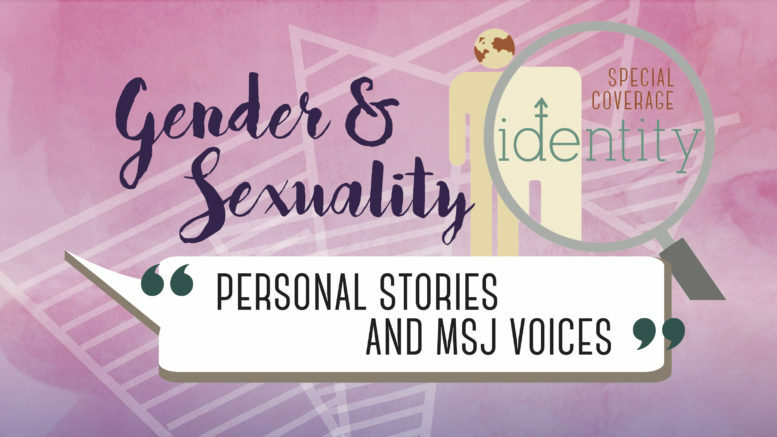 As part of the second installment of the our Identity special series, the Smoke Signal covered gender and sexuality at MSJ. This online extension includes a voluntary personal story from a member of the LGBTQ+ community as well as several student voices regarding the atmosphere for the LGBTQ+ community at MSJ. Personal story: The following is a voluntary submission from a member from the MSJ LGBTQ+ community. It was sent in following our presence at the Gay Straight Alliance meeting on March 14. We indicated that if members wished to make additional comments, they were welcome to reach out to us through email. “Even though trans people were allowed to use the locker room that matches with their identity, judgment will still discourage them from using the bathroom they want, especially if they are not out. Maybe the person you accidentally made eye contact with in the bathroom won’t interact with you at all, but it’s easy to imagine them going to their friends and laughing about you. It hasn’t happened in our school as far as I know, but I’ve heard of people being confronted or even bullied or assaulted in bathrooms. And in general, you don’t want to attract more negative attention than you need. Timothy talked about the intersection of Asian culture and the LGBT community at the GSA meeting, and I partially agree. The values of Asian culture are not to attract negative attention, which isn’t just people not accepting you for being gay. Sometimes people say they accept you and still unconsciously treat you differently. Other times they don’t treat you badly, but you’re still a curiosity to them. They gawk, and you still attract attention that isn’t positive. In Asian culture that isn’t a good thing. So some parents don’t want kids to be out. On the other hand, in LGBT communities, there’s a lot of western individualism that conflicts with these Asian values. There’s the idea that you should always come out as soon as possible, you should always be brash and unashamed and not care about what anyone else feels. But as an Asian, sometimes you actually do want to make your family and community proud. You don’t have to, but when you factor making others happy into your decision making for transitioning or dating someone of your own gender, the western-centric LGBT community thinks of it as you not being genuine to yourself. It’s basically equivalent to the LGBT community saying, your Asian culture and identity is what’s oppressing you. So I’m never 100% comfortable in most LGBT communities either, because they make me feel like I have to choose between being LGBT and following my Asian cultural values. The Asian majority at Mission means that people understand this feeling, which is nice. But I wouldn’t focus too much on LGBT troubles and tragedies if I were you though. I think it’s sensationalist and fetishizing other people’s suffering. Not all publicity by a third party has that malicious intent, but I still think it contributes unnecessarily to the tragic LGBT discourse. The media already portrays LGBT people as always the receptacle of hate, always crying and dying. I think this focus on LGBT suffering makes people less empathetic to us because it makes us seem less human. Any Smoke Signal coverage of LGBT issues should highlight people’s humanity and full range of human experiences, and not just their suffering. If you quote me on anything, it’s that I am not a victim, and I refuse to be one. I don’t like most LGBT books because the protagonist is most often tragic and powerless against their fate. Being LGBT is not a death sentence. Save your pity, I’m in this life to win! Talk about the bad situation and issues, but show how we’re resilient and fighting back. We’re humans who can laugh and dance despite all the bad news recently. Voices: Staff writers collected responses to the following questions from students. 1. Do you believe that the MSJ community offers a respectful and supportive atmosphere towards members of the LGBTQ+ community? Why or why not? 2. What can students and staff do to improve the atmosphere for the LGBTQ+ community on campus? Be the first to comment on "Special Coverage — Gender and Sexuality: Personal Story Online Extension"